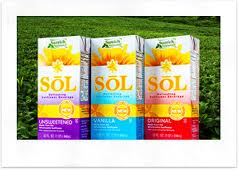 Smart Allergy Friendly Education: Sunrich Naturals SOL - A Sunflower beverage which may meet your allergy~friendly needs! Sunrich Naturals SOL - A Sunflower beverage which may meet your allergy~friendly needs! Looking for a nutritious, dairy-free, gluten-free beverage option? From what I can see from the ingredient list, it is also soy-free, egg-free and nut-free. Here is one of my latest finds which may turn out to be a fabulous alternative for your home. This shelf stable beverage is made from sunflower kernels and comes in three flavors: unsweetened, original and vanilla. Sunrich Sunflower Beverage Review from S.A.F.E. Sunrich Naturals Original SOL Sunflower Beverage, distributed by SunOpta Septic, Inc., Alexandria, MN. Ingredients listed include: FILTERED WATER, ORGANIC EVAPORATED CANE JUICE, SUNFLOWER KERNELS, SUNFLOWER LECITHIN, TRICALCIUM PHOSPHATE, ORGANIC TAPIOCA STARCH, EXPELLER PRESSED SUNFLOWER OIL, SEA SALT, XANTHAN GUM, GUAR GUM, NATURAL FLAVOR, CARRAGEENAN, VITAMIN A PALMITATE, VITAMIN D2, FOLIC ACID, D-ALPHA TOCOPHERYL ACETATE (NATURAL VITAMIN E). Since its inception in 1978, SunOpta considers itself to be 'an industry leader in the supply and distribution of natural and organic ingredients, raw materials, and consumer products'. For over 25 years they have been working with American farmers to create great tasting, wholesome organic and natural foods. The believe in creating sustainable American agriculture which will benefit future generations to come! Be sure to visit their website to learn more about their philosophy, their focus on providing quality organic and non-GMO foods, and partnerships they have created with American farmers. Want to know where you can buy this product? There 'where to buy' link can be found on the bottom right hand side of their product page, Sunrich Product Page. We have found SOL to be a delicious addition to our smoothies! Add some frozen fruit or yogurt OR a few tablespoons of SunButter and your favorite dairy-free, soy-free ice cream! I loved watching my kids asking for seconds of this delicious and nutritional beverage! Hi! I recently reviewed the new SOL Sunflower beverage and my whole family loved it. I'm currently hosting a giveaway for one case of the milk in the flavor of your choice. And there will be 3 winners!